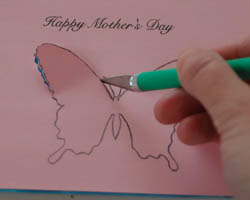 Pick between three printable Mothers day cards to make the perfect homemade greeting for Mom. Why? 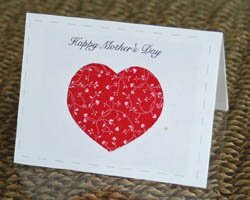 Because store bought greeting cards are expensive, and your mother is sure to be impressed that you made this card yourself. It will mean so much more to her that it was made by you! Pick between three different cover designs, and then pick between three different verses. 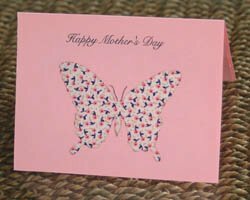 The design on the front of the card is cut out, and a piece of fabric is placed behind. You can get very creative with this project, adding in scrapbook paper or different textures of fabric behind the cut out to make a very unique look. 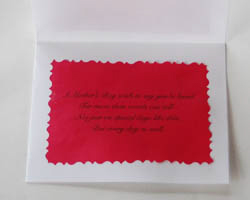 This is a quarter-fold card, measuring 4 3/4" x 5 1/2 " card, so it is the perfect size to fit in a standard A5 envelope. Small piece of scrap fabric, in colors that coordinate with the card stock colors. 1. 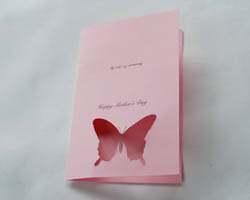 Begin by choosing what cover design you would like for the printable mothers day card. Choose between a heart, butterfly, or the words "MOM". If this craft is for a child, the heart is the easiest design and an exacto knife is not needed, as the heart can be cut out with scissors. The other two designs will need an exacto knife. 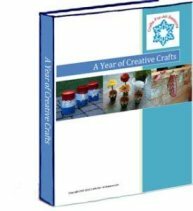 The photos below show completed cards of the three different cover designs to help you choose. Click on the link below to open up a PDF file of the card to print. 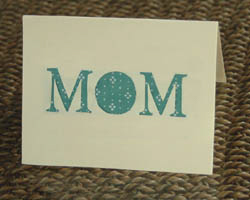 Print out the card on the desired color card stock. 2. Next choose which verse you would like for the inside of your card. Once you choose one, click on the link to open the template and print this out on a piece of contrasting card stock. For Verse 1, Click Here: A Mother's Day wish to say you're loved Far more than words can tell-- Not just on special days like this, But every day as well. For Verse 2, Click Here. To wish you "Happy Mother's Day" and especially tell you, too That there couldn't be a mother loved any more than you! Have a Happy Mother's Day! 4. 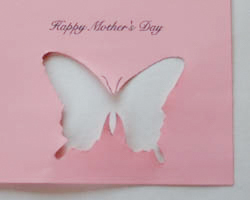 Fold the card in half lengthwise, as shown. 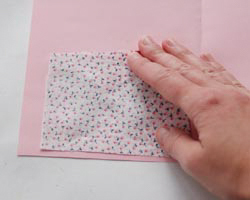 On the back side of the design, apply glue all along the edges of the cut out design, then place your small piece of fabric down on top of this, and allow to dry. 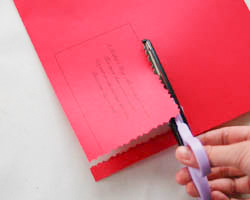 Add some glue to the edges of the paper to secure the folded card. 5. 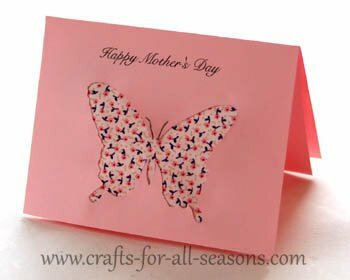 You will need to cut a rectangle from the coordinating color of card stock, to cover the fabric on the inside of the card. Using the card stock that you printed the verse out on, cut a 4 3/4" x 5 1/2 " square from an area that does not contain the rectangle with the verse text. 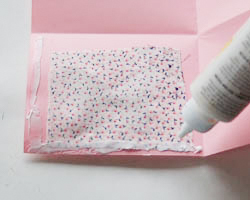 Glue this over the fabric to cover (no photo is shown for this step). 6. Cut out the rectangle with the verse on it with fancy edge scissors. Stay just inside the rectangle when cutting so you will not see the outline. 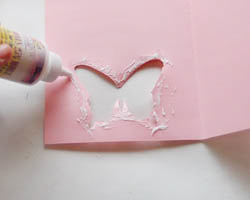 Glue this inside of the card.